I used to love waking up on Easter morning and running to find my Easter basket in the living room. It’s just like Christmas, but with more candy. Lately, though, I have noticed that Easter baskets have started to look pretty gaudy. They are all made of brightly colored plastic and covered in cellophane. 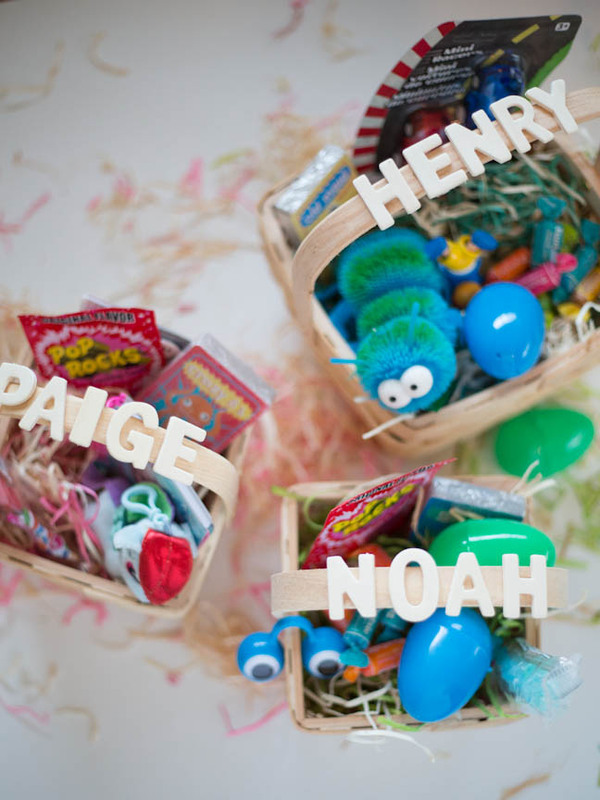 This year I decided to make some simple Easter baskets for my little ones, and fill them with specific gifts and candy that I know they will like. 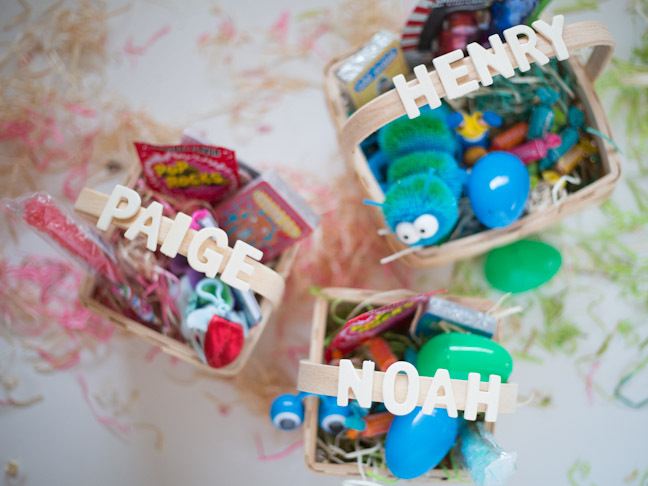 I decided to customize them with DIY Easter basket name tags so they can tell which basket is theirs. Follow along and make some of your own! Toys, candy, and Easter eggs! 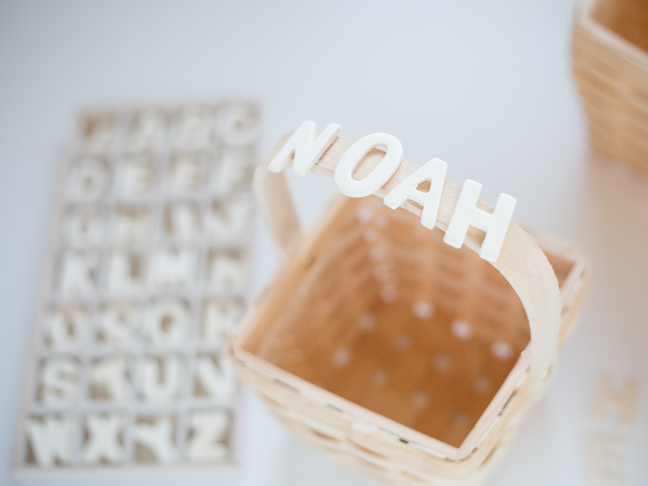 Step 2: Spell out your child’s name on the handle of the basket. Arrange the letters so that they all fit. 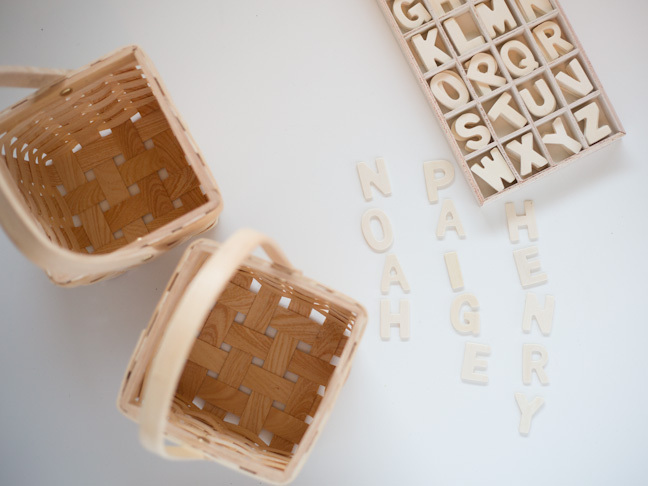 You could paint your letters fun colors, but I decided to leave mine natural so that they would contrast with the fun colors of everything going into the basket. 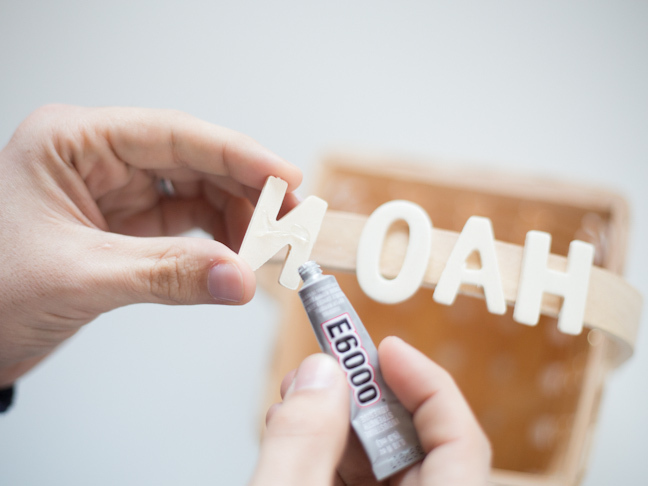 Step 3: Put a small dab of E-6000 glue on the back of each letter and apply to the handle of the basket. Step 4: Push down on the letter to glue it to the handle. You can adjust the spacing and angle while the glue is still wet. 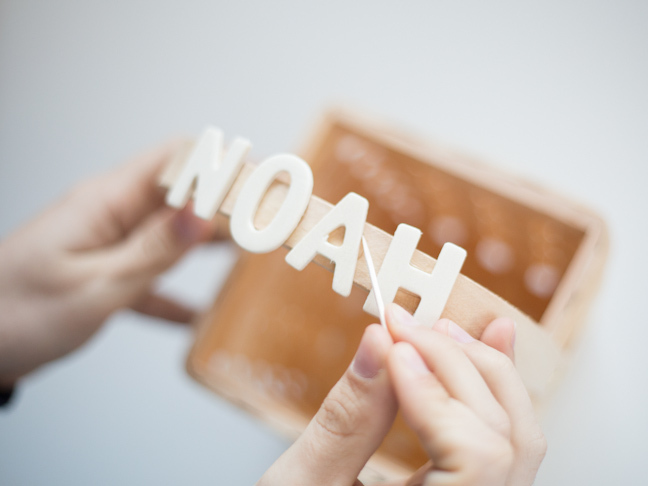 Step 5: Using a toothpick, you can scrape away the excess glue along the edges of the letters. Remember that a little goes a long way! 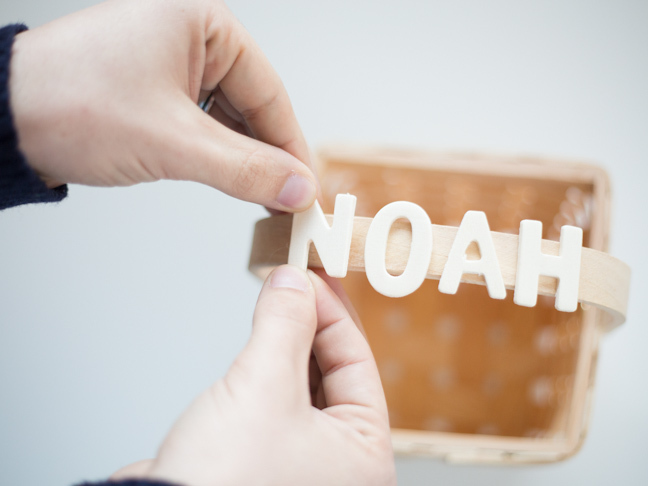 Step 6: Once the glue is dry and all the letters are attached, you can fill your Easter baskets with goodies! 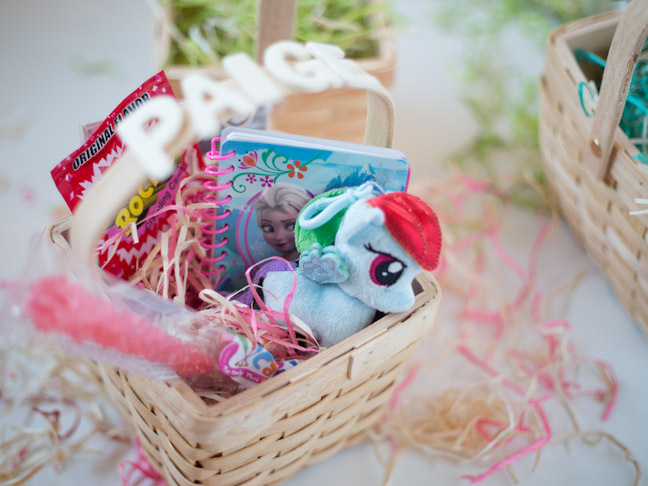 Start by placing a bed of colored straw in the bottom of the basket. (This will help it look fuller, and also cushion the eggs when these get used for your Easter egg hunt later on.) 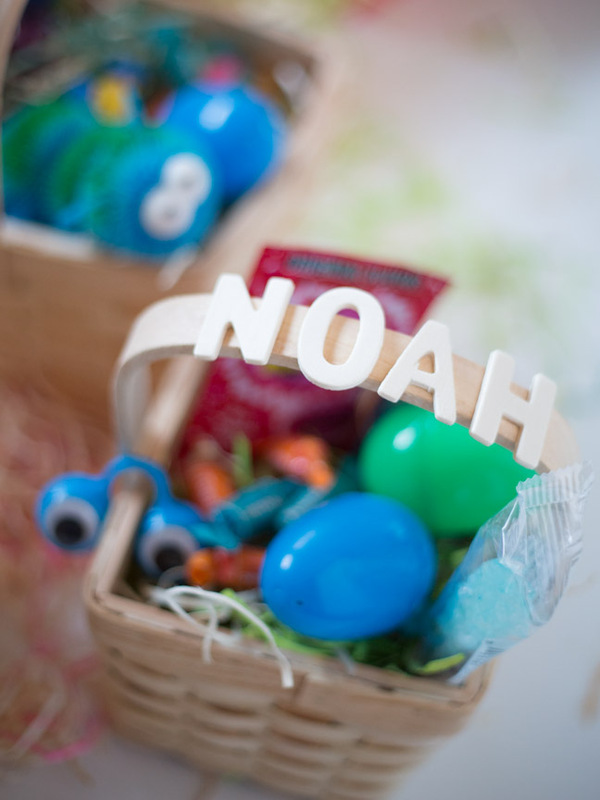 Then fill up the basket with treats and toys, and hide it away until Easter morning. Happy Easter!